In each issue of Word Wise, you get writing tips to use to simplify the writing process. I’m excited about our new look, both in this newsletter and on the Word Wise website. What do YOU think? Let me know! Get More Simple Writing Tips on Pinterest! FEATURE: Writing Formulas: Should You Use Them – and When? A writing formula provides a handy outline for you to follow as you work on a writing project. And why wouldn’t you use one? Good formulas are proven and have stood the test of time. They’re effective when used by all kinds of writers in all kinds of niches. And they save you time! Writing formulas provide structure. What may be misconstrued as a mechanical tactic – or even “cheating” – can actually provide a proven framework to make your content and present it more strongly. Writing formulas are project-specific. You’ll follow a different formula for an appeal letter, for instance, but a different one when writing a tweet and yet another formula when writing a long-copy web sales page. Use them in content, too, for this simple reason: they work. Writing formulas help you get unstuck. 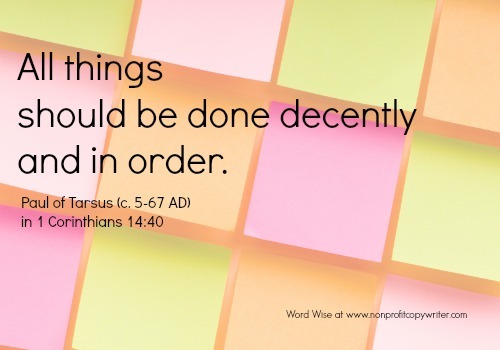 Follow the formula’s acronym to give you ideas and organize your material. 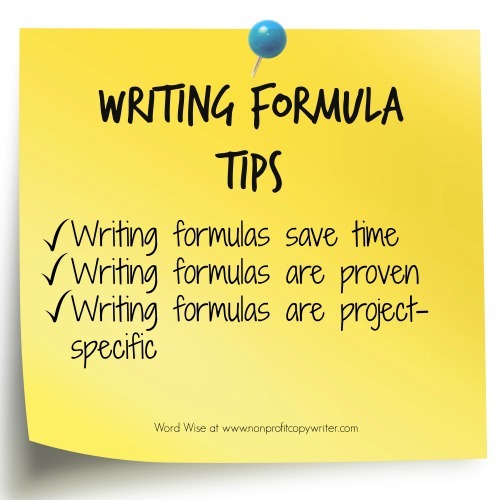 Read more tips about using writing formulas) … and check out all kinds of writing formulas on our Writing Formulas Pinterest board.